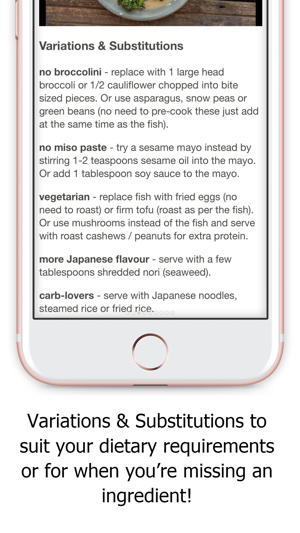 The '6-Ingredient Dinners' app is designed for when you just want new ideas for something simple for the weeknights because you're really short on time during the week. Or for when you don’t have a huge amount of time to surf the net looking for recipes. 100+ Simple 6-Ingredient Dinner Recipes. 30-Minute and 15-Minute Recipes because mid week needs to be really quick. Substitutions for when you're missing an ingredient. Step-by-step instructions so it’s really clear what you’re looking for at each step. When your plans change, the detailed ‘Waste Avoidance Tips’ will save you from the guilt of throwing away ingredients. No internet access required to view recipes once downloaded. Prepare-ahead details to help you get organized. Storage instructions so you’ll know which meals are freezable. Most recipes serve 2 - can be easily doubled or halved as needed. 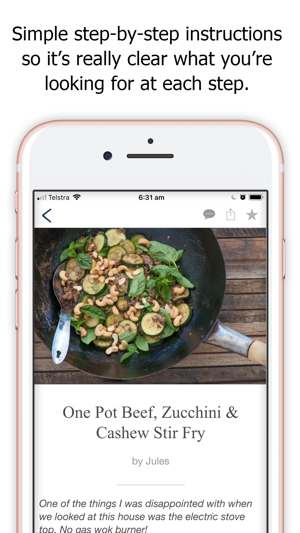 Save your favourite recipes to your own personal favourites page. Quick and easy to search so you’ll find the perfect recipe fast. PLUS! NEW 6-Ingredient Dinner Recipes added every month! I am so happy to have another way to easily access Jules Clancy’s recipes! Stonesoup dinner recipes have saved me so much time, making it easy for us to eat healthily. This app is a bargain! Jules recipes have stopped me from picking up takeout on busy work nights. They save me money and I don’t have to feel bad about throwing away packaging or eating less healthy food. I spend a shorter time in the kitchen (the app lets you choose recipes ready in 15 or 30 minutes) and shopping for these 6 or less ingredient meals goes quickly. I often already have some of the ingredients... Hands down fresh and delicious meals, too. 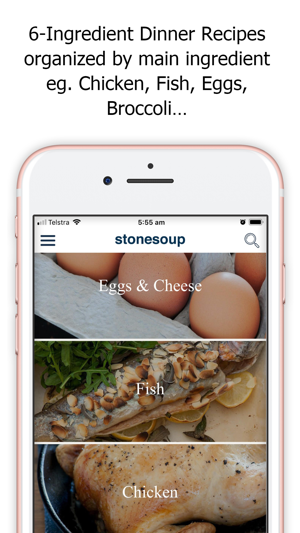 I have been a fan of Stonesoup for years and have every cookbook but this app is a real game changer. I have always been the type of grocery shopper who buys what is on sale and what looks good then goes home and decides what to do with it. Unknowingly, I was doing what food expert Jules Clancy advocates. When planning a meal, I look for recipes that closely resemble what I have on hand. Her recipes are simple, healthy and easily adaptable, at the end of her recipes she even tells you how to do many adaptations. 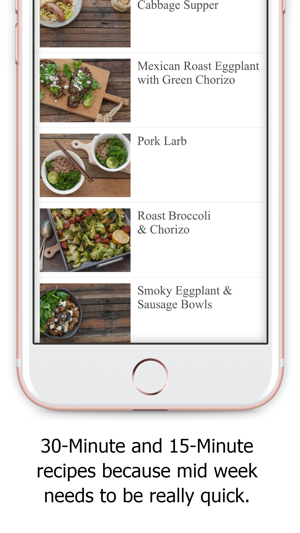 The new app lets me go to the food that I have on hand and look at the recipes! I really like that her recipes are healthy and allow me to flavorfully eat food that goes along with my ‘no refined carbs or sugar’ eating plan. Even though the way that I try to eat is closely aligned with hers, there are differences and her recipes not only allow, but encourage those differences. So many recipe books are for this diet or that diet, her recipes are easily adaptable to most any diet. This ‘foodie’ is very excited to dive into this new app! I’ve been following Jules’ blog for quite some time now, and her recipes have yet to disappoint. They are incredibly simple to make always taste delicious! She takes the time to add variations to each recipe and I can’t stress how many times they’ve saved my dinner. Whether to give me inspiration to try something different with a dish or if I’m not able to find a specific ingredient in the supermarket. They allow you to be more flexible in the kitchen based on how you feel that night. I’ve never been able to follow any other recipes because I’ve always felt restricted to just doing what the recipe says, but Jules’ recipes are a simple foundation that are amazing on there own or inspiring enough to get fancy with! The app just makes accessing them even easier. My only complaint right now is the lack of recipes, but I know as the app is further developed that will change.